According to an article in the Metrowest Daily News a Framingham man was recently arrested for drug distribution. The article states that the Framingham Police Department was investigating the man and was working with a confidential informant as part of the investigation. The police had the informant set up a heroin deal with the man. Specifically, the informant allegedly arranged a drug deal during which he was supposed to pay the man $350 in exchange for three grams of heroin. The deal was supposed to take place at Dunkin Donuts on Cochituate Road. The article indicates that after the informant set up the deal, the police followed the man from his apartment to the Dunkin Donuts and reportedly watched the informant purchase the heroin from the man. Following the deal, the man left in his car and the police pulled him over shortly thereafter. The police did not find any drugs in the car, or on the man’s person. The police then went on to search the man’s apartment. Again, no drugs were found, however the police did recover some items associated with drug distribution including packaging, a digital scale, and a tool called a heroin press. As a result, the man was charged with possession with intent to distribute heroin. 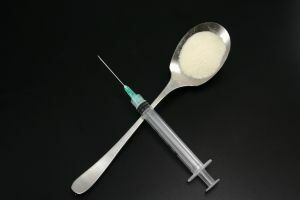 For the Commonwealth to prove that the man possessed heroin with the intent to distribute it under G. L. c. 94C, § 32, it would have to show the following beyond a reasonable doubt: (1) that the substance reportedly sold to the informant was in fact heroin; (2) that the man possessed some perceptible amount of the heroin with the intent to distribute it to another person; and (3) that he did so knowingly and intentionally. Fortunately for the man, there do appear to be some problems with the Commonwealth’s case. For starters, the Commonwealth almost never shares the identity of a confidential informant with the defense. Generally, the police do not want to put an informant in any sort of danger, which might happen if it became public that the informant was working with the police. Additionally, the police want to be able to continue to use an informant, which they would not be able to do if it became known that the individual was working with them. Because the Commonwealth will likely be unwilling to identify the informant, it will not be permitted to call the informant to testify against the defendant. Therefore, the police will have to rely solely on their observations to prove the Commonwealth’s case against him. Given the information laid out in the article, it appears that the police officers’ observations may not be sufficient. In particular, the article alleges that the police observed the sale take place, however, there is no indication as to how detailed their observations were. While they may have seen the man and the informant meet at the Dunkin Donuts and the informant may have told them that a sale was made, if the police did not definitively see some sort of exchange and the specific nature of the items exchanged, the Commonwealth may have trouble establishing that the man did in fact sell heroin to the informant. Another issue that may be difficult for the Commonwealth to overcome is the fact that the police do not appear to have found the $350 that the informant gave to the man on his person directly after the alleged sale. If the man did in fact sell the informant the heroin, one would expect him to have the informant’s money on his person, however, there is no indication that any such money was found. Last but certainly not least, the fact that there were no drugs actually found on the man, in his car, or in his house, is likely to be a problematic issue for the Commonwealth as well. The lack of drugs found anywhere certainly undercuts the Commonwealth’s claim that the man is a drug dealer. While some materials associated with drug dealing were found at the man’s house, it is not outside the realm of possibility that a user would have some of those items in his home, and therefore the man could potentially put forward a defense of straight possession rather than possession with intent to distribute. Moreover, at least some of the items found have other completely innocuous uses, and therefore the mere fact that the man was in possession of them does not necessarily mean that he was using the items for criminal purposes. Regardless of the potential issues with the Commonwealth’s case, the man is facing serious charges and will need an experienced attorney to identify the defenses he has and present them to the court. If you or a loved one is facing similar charges, you will likewise need a skilled attorney. Attorney Daniel Cappetta has successfully handled numerous drug cases and can help you get the best possible outcome in your case. Call him for a free consultation today.